Feeding childhood independence or parental fears? This is a photo of my son on the very first day he was allowed to walk to school by himself. He was five-and-a-half years old and his excitement is obvious. As his mum, I was less thrilled. I watched the clock until about 9.15am, at which point I figured that the school would have rung by now if he hadn’t arrived. Even four years later I start getting a bit antsy if he and his younger brother haven’t appeared in the walkway across the road by the time I think they should have. Likewise, my pre-schooler will climb to the top of a three-storey rope pyramid at the playground and bounce and wave at the top, delightedly yelling for my attention. I let her see my pride, but not my fear. Because I think that an important part of being a parent is feeling the fear but letting them do it anyway. I warn them about speeding drivers, stranger danger and slippery ropes, but I try to make them aware of the risks without giving the impression that the world is a fearful place. It’s a delicate balancing act. It was the release of two reports today that got me thinking about these things. A new Ministry of Transport report, 25 years of New Zealand Travel: New Zealand Household Travel 1989-2014, looks at long-term travel trends, including how children travel to school. It found that the percentage of primary school journeys taken by foot has dropped from 42 percent to 29 percent in the past 25 years. Cycling has dropped from 12 percent to 2 percent and car travel has climbed from 32 to 57 percent. The traffic congestion and health ramifications of these changes have been frequently discussed, but looking at the photo of my son, I get the sense that car commutes are depriving our kids of something more. Nurturing and protecting our children is essential, but as they grow older they need increasing opportunities for independence. Walking to school by themselves is a thrilling adventure that gives young kids confidence and a sense of achievement (until they’re a bit older and then it’s just a drag – but too bad). I know that the roads are too busy or school is too far to walk for many families, but it amuses me to see parents circling the carpark and side streets trying to get a park as close as possible to the school. Drop them down the road and let them walk the rest of the way! The other report to come out today was ChildFund Alliance’s sixth annual Small Voices, Big Dreams survey, one of the world’s most comprehensive polls of children’s views. 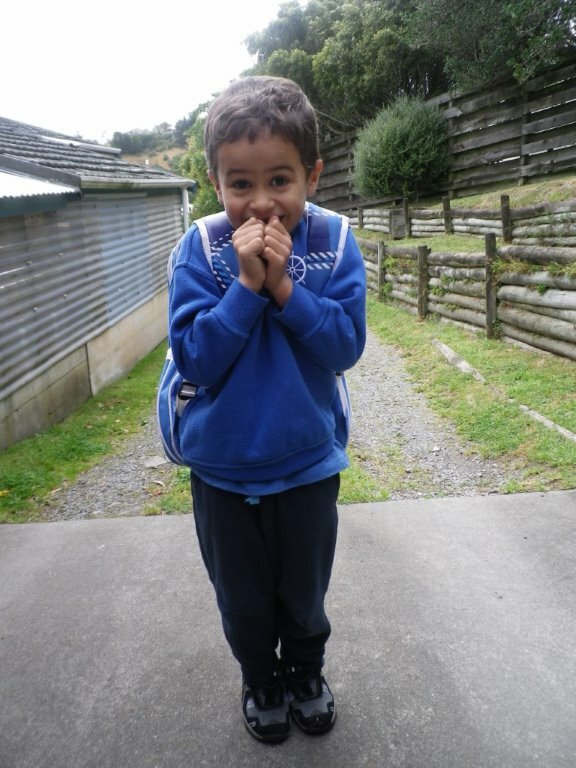 The media release was titled Kiwi kids see danger in the ‘everyday’. It found that “young Kiwis feel among the most vulnerable in the developed world, especially using the Internet”. According to the report, New Zealand children identified walking alone (81%) and being online (80%) as risky activities, followed by being at school (52%), at home (50%) and with friends (32%). These figures sound very disturbing. Perhaps we have done too good a job at teaching children that evil lurks around every corner? Because surely the figures aren’t reflecting actual experience. Identifying places that children may be at risk is not the same as “feeling vulnerable” or “believing they are at risk or abuse of mistreatment”. Talking to a few teachers and principals, they were surprised by the report’s conclusions. Schools are big on teaching children about cyber safety, but they find the kids are confident internet users who know there are places and online conversations to stay away from. And most kids know there are things they can do to ensure (or at least increase) their safety beyond cyberspace. It’s healthy to know that there are risks in the big wide world. Being aware and alert is not the same as being afraid. The media release of the report is here. Do you agree with the findings? Leave your comments below.